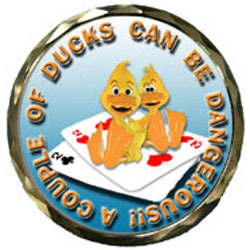 This is the Couple of Ducks poker spinner and card protector, it lets others know that you are not afraid to hold the deuces: It is 2 inches in diameter, 2.5 mm thick. Image is set on an aluminum sticker with epoxy coating. The spinner has a diamond cut, gold-colored edge and gold colored back over brass. The Couple of Ducks Spinner comes packaged in an acrylic case. Weight: 2.8 ounces.